The gradual marginalization of PowerPC Macs is bound to accelerate sharply with the release of Intel-only Mac OS X 10.6 Snow Leopard, and one can anticipate that it may not be too long before PowerPC Mac owners begin to be confronted with the frustrating up-to-date browser issue that is one of the biggest problems for Classic Mac OS holdouts these days. It’s already happening to some degree. For example, Stainless, a very nice little WebKit-based indie browser somewhat inspired by the Google Chrome browser project – and which I’ve become quite partial to on my Unibody MacBook – only works on Intel Macs. If precedent is any guide, the best bet for browser sustainability on Apple’s orphaned OS versions will be the Mozilla Gecko-based browsers. WaMCom and lately Classilla developments of Mozilla for Classic users are a case in point. My browser MO is generally to run one example each of the Safari/WebKit, Mozilla/Gecko, and Opera/Presto browsers simultaneously, which pretty much keeps the bases covered. On my MacBook, it’s the Opera 10 Turbo RC, of which the final version is slated for release tomorrow; Firefox 3.5.2, and Stainless – the latter both because I like Stainless, especially its cool tiny icon bookmark feature, and because I haven’t yet got around to upgrading the OS to Safari 4’s required Version 10.5.7 or later (I’m at 10.5.6) and may now just wait until I install Snow Leopard. I’ve installed Leopard 10.5.8 on my 17″ PowerBook and am using Safari 4.0.3 on it, along with Firefox 3.5.2 and Opera 10 Turbo. On the Pismo, running OS X 10.4.11, it’s a bit of a different story. Ironically, I’m running Safari 4.0.3 on the older machine, and also Opera 10 Turbo, but Firefox has not been a happy camper on the Pismo -with its poky Rage 128 Mobility GPU and 8 MB of VRAM – for some time now, so for the past couple of years my preferred Gecko browser on that ‘Book has been Netscape Navigator 9, which is based on a now-obsolescent version of Firefox 2. It looks and works great, but alas development and support were discontinued over a year ago. I like to run fairly up-to-date browsers, as you tend to run into compatibility issues with older ones (for example, some pages on Apple’s website don’t render well in Navigator 9 these days) and the old browser doesn’t support session restore, which I find it a pain to live without. It’s also received some overdue and much welcome interface tweaks, with an updated, brighter, more contemporary, and IMHO more attractive look, although there are still some antiquated touches such as a tab close button on the far right of the tab bar rather than having one more conveniently placed on each tab. Its download manager is completely reworked, including (hooray!) support for cross-session resumable downloads, plus there are new-tab and new-window command line options and fully customizable toolbars. With SeaMonkey 2, everything I need is there: tabbed browsing and a real progress bar and (hooray again) session restores are now supported. 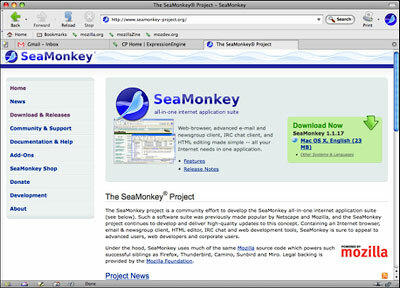 The non-browser elements of SeaMonkey don’t really interest to me, so I’ve tended to overlook the program in recent years, but it does offer a thoroughly modern browser core with all the web feature support from Firefox 3.5.1 in a package that works reasonably well on the old Pismo under Tiger, although I do find that after a week or so of uptime it tends to slow down and start dipping into virtual memory to a more painful degree than does Navigator 9. That sent me checking out the latest version of Camino (1.6.9), the Mac-only Cocoa interface browser that also uses Mozilla.org’s Gecko engine. Camino is a browser that I’ve tried hard to like, but I kept getting dragged back to Navigator 9 on the Pismo because the latter just works so well, and to Firefox on the newer machines (especially the Shiretoko Intel-optimized build on the MacBook), because I’m addicted to a few Firefox plugins, such as WeatherBug and some of the alternate interface skins, including one that makes it look like Navigator 9. However, Camino is a better performer than Firefox on the memory-challenged Pismo, but a major shortcoming is that it’s cranky about answering clicks on its interface windows to bring it forward, especially when coming from Classic Mode applications. This issue does not afflict either Navigator 9 or SeaMonkey 2. Camino 1.6 now includes an editor that allows deleting, renaming, and reordering search engines. Camino also supports OpenSearch search engine plug-ins. New search engines can be added to the toolbar’s search field by automatic discovery or by web pages that provide links to OpenSearch plug-ins. Camino 1.6 removes the Find panel and replaces it with a simple, unobtrusive Find toolbar that appears near the bottom of the browser window. With back and forward buttons at your fingertips and incremental find, the Find toolbar makes finding words on a page easier than ever. Camino 1.6 includes a scrolling tab bar. When more tabs are open than can be displayed in the tab bar, arrows appear at the right and left edges to allow scrolling the bar. As part of this change, the tab overflow menu has been replaced by a menu displaying all open tabs in the current window. Updating to the latest version of Camino is even easier than ever with Camino’s new auto-update feature. Integrating with the “Sparkle” framework, Camino now automatically checks for new releases and optionally installs them. Camino now includes enhanced AppleScript support. AppleScripts can now refer to individual tabs and windows, add, open, and delete bookmarks, and even have custom toolbar icons. In addition to saving logins and passwords in the Mac OS X Keychain, Camino 1.6 can now store information for multiple accounts in the Keychain. Camino also maintains computability with Safari Keychain entries, allowing easier switching between web browsers. Camino supports the detection of RSS/Atom feeds in web pages. When a feed is found, an icon appears in the location bar. Clicking that icon and selecting a feed will send the feed to your default Mac OS X feed reader. New in Camino 1.6 is the ability to pass feeds to certain web-based feed readers including Google Reader, Bloglines, and My Yahoo. Camino includes the built-in Mac OS X spell-checker on every text field. Unlike Firefox, this spell-checker is the same one used throughout Mac OS X. You don’t have to worry about making spelling mistakes when writing for your blog, leaving comments, or posting on forums. New in Camino 1.6: For users of Mac OS X 10.5, you can change the active spelling language. Camino includes support for “session saving”, or optionally remembering what pages you were visiting when you quit and automatically loading them the next time you start – perfect for all those times you have to install Mac OS X updates. This is a must-have feature for me. Camino includes an elegant built-in popup blocker as well as built-in adblocking and gives you the option to show the popup, whitelist the site, or never get prompted again. Additionally, Camino includes the ability to keep Flash animation from loading until you’re ready (Flashblock) as well as the ability to disable Java. Camino 1.6.9, released August 26, is described by the developers as a security and stability update for Camino 1.6.x. Upgraded to version 1.8.1.23 of the Mozilla Gecko rendering engine, which includes several critical security and stability fixes. Camino 1.6 is a universal binary and runs natively on both PowerPC- and Intel-based Macs.